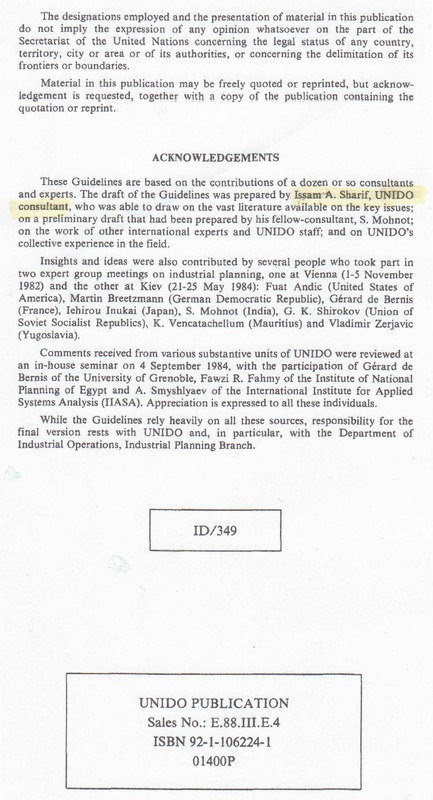 He was also assigned by UNIDO for the preparation of the bellow-mentioned UNIDO formal publication. This assignment brought him also the recognition for being one of the leading contemporary planners of developing countries. Er wurde außerdem von der UNIDO mit der Vorbereitung der unten erwähnten offiziellen UNIDO-Publikation beauftragt. Diese brachte ihm auch seine Anerkennung als einer der führenden zeitgenössischen Planer in Entwicklungsländern. كما تم تكليفه من قبل منظمة اليونيدو لاعداد مؤلف اليونيدو الرسمي الخاص بالتخطيط الصناعي ادناه. وكان هذا بمثابة اعتراف بكونه واحد من ابرزمخططي البلدان النامية المعاصرين. 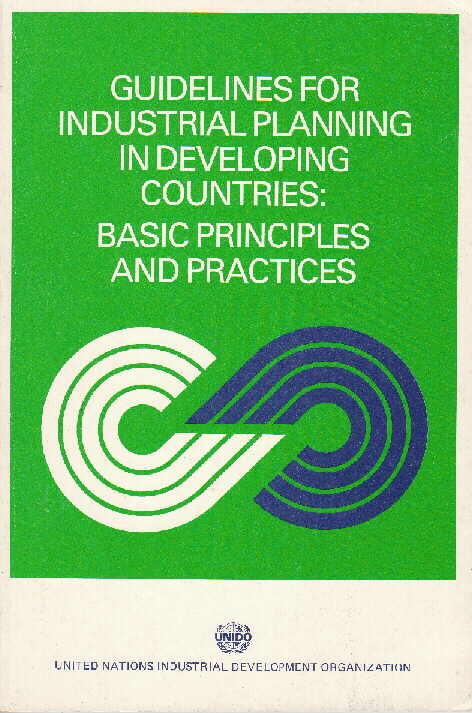 There was a time when representatives of industrialized countries to UNIDO were skeptical about the usefulness of the idea of preparing a publication on industrial planning for developing countries. 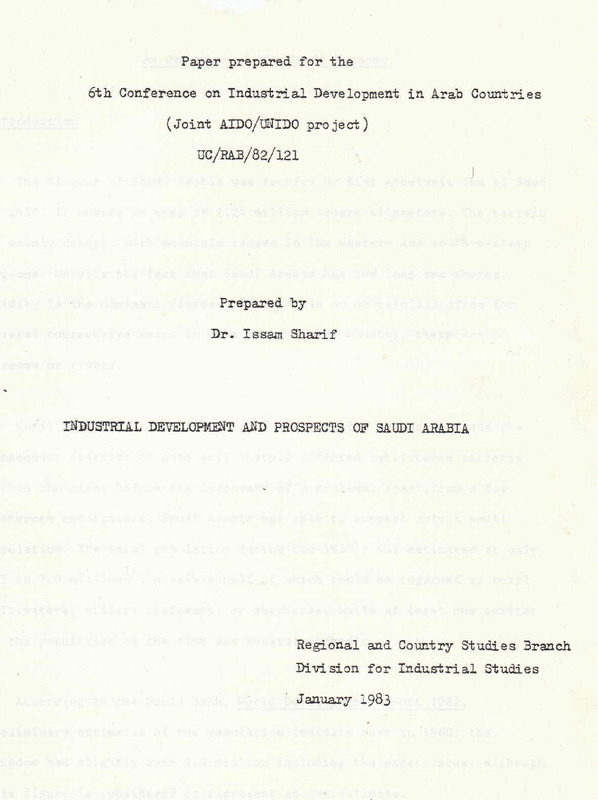 Planning itself was regarded as a Soviet invention and the drawbacks of the Soviet economy were used as an argument against the application of planning in developing countries. It was Sharif who was able to change this attitude at least for some time. He proved that planning is as old as human civilization. He chose the Pyramids of Egypt to make his case. Building a big pyramid required the engagement of approximately 250.000 people over 20 years. The workers were employed for three-month stints. This required in turn the availability of sufficient production capacities to produce sufficient food surplus to feed all those people. It required, in addition, the availability of sufficient cutting tools to chisel millions and millions of tons of stone, sufficient crude metals, coal and smelters to produce those tools. It required sufficient trunks and ropes to pull all those stones. It required sufficient means of transportation to transport food, people and materials. The size of a big pyramid reflects above all an important portion of the accumulated economic surplus of Egypt at that time over the 20 years of construction period. The measurement of this surplus before deciding on the size of the pyramid constitutes an essential part of the planning efforts, which can only be done on the basis of scientific methods. The work of the architects could only have been started after the measurement of the portion of the economic surplus, which was possible to devote to the construction of the pyramid, was accomplished. This is simply because the architects had to fit the size of the pyramid within the limits of the relevant estimated portion of the economic surplus. Building the pyramids under those circumstances was extremely complex due to the huge size of the interrelated inputs and outputs. It could have never been based on the principle of trial and error technique. Otherwise the managers at the building site would have been continuously confronted with bottle necks. This would have caused chaos leading to enormous economic losses and the construction of a pyramid could never have been completed. The pyramid could never have been accomplished without "a priori" prepared compact plan, which was based on scientific methods. It was the priests with their experience over thousands of years who were able to accumulate unprecedented knowledge in architecture, anatomy, astronomy, chemistry, planning and the like. They must have developed the same methods which were developed thousands of years later by the Soviet planners. With the help of these methods the priests were able not only to estimate the economic surplus of Egypt, but to provide a compact plan, which optimally uses the available economic resources to build a pyramid of a given size over a given period of time. A pyramid is not a productive project. However, applying of planning for the purpose of industrialization requires the measurement of the economic surplus in much the same way as in the case of planning the construction of the pyramid. The task of industrialization of poor developing countries is huge. Poor developing countries must restructure their economies and build modern industrial capacities and infrastructure almost from scratch in much the same way like the construction of a pyramid. Most of them have been failing to achieve any tangible progress because they continue to waste their economic surplus. Despair and hopelessness drives thousands of people to leave such countries and risk their lives in small boats across the seas to reach the coasts of rich countries, where they are not welcome. These people are not aware how rich their home lands are. The first soviet plan shows how a country with a devastated economy after the First World War was able to use its modest economic surplus in building a huge industrial infrastructure. The first major project of soviet planning included the construction of a network of 30 regional power plants, including ten large hydroelectric power plants, and numerous electric-powered large industrial enterprises. Much could also be said on the development of the capital goods industries, were the Soviet Union evolved from a mainly agrarian society and became one of the world's three top manufacturers of a large number of heavy industrial products. However, the Soviet Union lagged far behind in the output of light industrial production and consumer durables. This is mainly because the economy of the Soviet Union was based on a system of state ownership. There are two types of planning. The first is “directive planning” and the second “indicative planning”. The former was applied in centrally planned economies and the latter in mixed economies. The effectiveness of “indicative planning is usually underestimated. 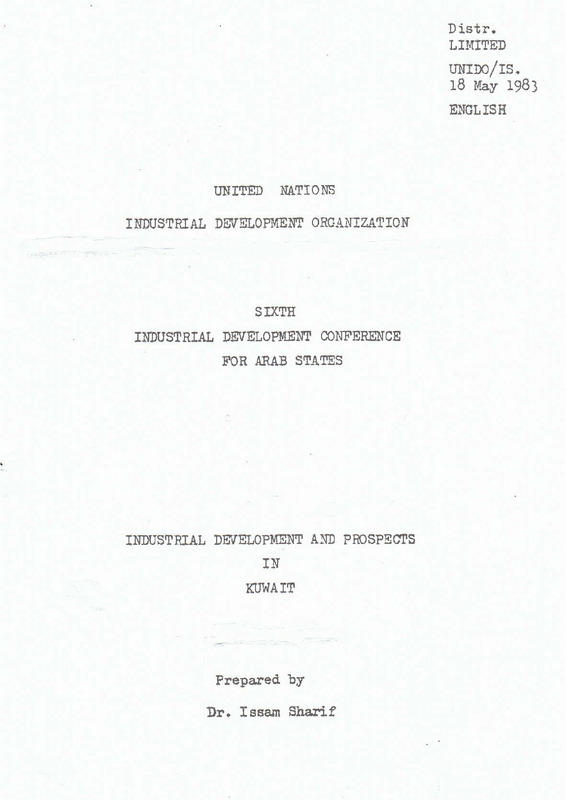 The Indian experience in planning, which was based on “indicative planning” showed, for example, how providing the necessary incentives in accordance with the industrial policies and strategies to the producers in the private sector could boost light industrial production in poor countries. Developing countries seeking the restructuring of their economies could also draw great lessons from the German 4-year plan. The Four Year Plan (1936 - 1940) was a series of economic reforms created by Nazi Germany. It sought to reduce unemployment and dependency upon imported raw materials. The latter was realized mainly on the basis of increasing synthetic fiber production. It also sought the increase of industrial output on the basis of increasing of heavy industries and automobile production, as well as expanding the infrastructure. The latter included numerous building and architectural projects and further development of the Autobahn system. The 4 - year plan shows that planning must not necessarily be based on a system of state ownership. In Germany the 4- year plan dealt with big corporations, such as IG-Farben, the group AGC, Siemens, Krupp, Mannesmann, the Deutsche Bank and the like. On the other hand this plan shows how the power of planning was used for evil purposes, because it sought in the last resort the development of the manufacturers of weaponry for the purpose of conquest and destruction. The commitment of the Governments of poor developing countries to provide for the necessary preconditions for applying scientific planning's methods is the first step towards discovering the hidden wealth of these countries and envisaging the best ways for restructuring their economies and accelerating economic growth.